tail -f /of tid-bits and lesson$ learned. Three heads are better that one! Sometimes, simplicity is better! If you need to keep the system root password secure and do not want to spend a ton of money on software, compliance audits and consulting, use this method to generate your root passwords. This method does require 2 - 3 people, as each will be generating a portion of the key. Of course you can change the parameters to suit you needs. In this example, 3 people will be responsible for creating 8 characters of a 24 character key. Simply follow the steps below. Have the first person enter 8 characters of the password into the computer and then write those characters on one side and label it (A). Fold the the paper in half, staple closed and leave it for the second person. Next, have the second person enter 8 more characters into the computer and write those characters on the blank side and label it (B). Fold the paper in half, staple closed and leave it for the third person. Then, have the third person enter 8 more characters into the computer and write those characters on the blank side and label it (C). 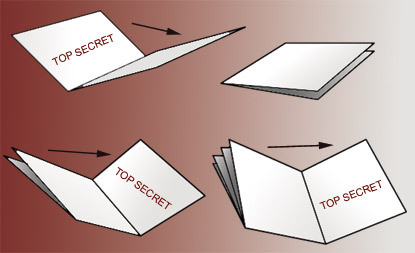 Fold the paper in half, staple closed and seal it in an envelope labeled with the system name, then set it in a safe place, preferably in a D.U.M.B. where no one can ever get to that Gold key. It's not likely to be any cave-ins in those places - right? When the computer asks you to verify the password, have each individual in order enter their portion of the key. There you have it, a 3 person 24 character key. Use this method if none of the system adminsitrators need to use the root password and have set up 'sudo' for their needs. If you ever need the password, you can retrieve it from the safe location and when fishined use the same method to create a new one. The more random each person's key is the better. Do not use any portion of the key as a part of another password on any system. User-Mode Linux: Has udev rules got you in a SIOCSIFADDR bind? Postfix - No entropy for TLS key generation? Apple to the NSA - did they really give the NSA the middle finger? SuSE Shellshock - Don't be so shocked. Threads in BASH? Try a TRAP! Super efficient & self regulating. Using methods designed over 100 years ago, utilize Tesla's One-Wire or the Common Ground Two-Wire supplies to Power LEDs from low voltage sources. An Ohio born national, with over 17 years in the IT industry, Sastri is a Freelance CIT who helps individuals and companies find solutions to their IT puzzles. Legal Disclaimer: I Am Not A Lawyer (IANAL), and This Is Not Legal Advice (TINLA). This website is religious speech and the free exercise of my religion which is protected by the First Amendment freedom of speech and freedom of assembly clauses. Everything on this website consists of religious and political beliefs and speech and opinion that is not factual and not actionable. Any attempt to censor this information or to compel me to take any other approach is a violation of my sincerely held religious views. I do not claim to be a "sovereign citizen". This information source was established to prevent terrorism, not promote it. I define any attempt to deprive anyone of life, liberty or property without their express consent manifested in a way that only they define as an act of terrorism. To the fullest extent, I make no guarantees or promises or representations about the effectiveness of anything appearing on this website, nor do I "profit" in any way from the information presented. Furthermore, I disclaim all warranties, express or implied, including, but not limited to, implied warranties of merchant-ability and fitness for a particular purpose and non-infringement. I do not represent or warrant that the functions or offered services contained in the site or external functions and offered services will be uninterrupted, resolved or error-free, that any defects will be corrected, and or that this site or the server that makes the site available are free of viruses or other harmful components. I do not make any warranties or representations regarding the use of the materials in this site in terms of their correctness, accuracy, adequacy, usefulness, timeliness, reliability or otherwise. By downloading, quoting, requesting or using anything from this site, you automatically become consenting parties to my Use Agreement and agree to incorporate all of this websites materials, links and all linked websites materials in their entirety. You agree to indemnify, defend, and hold harmless myself, ensigns, heirs, trust and its trustees, licensors and suppliers from and against all losses, expenses, damages and costs, including reasonable attorneys fees, resulting from any violation of these terms and conditions or any activity related to the use of this site and services. All information released or submitted by me shall be goverened by this franchise agreement and as a requirement of the mandate for equal protection and equal treatment is subject to change without notice and shall survive any termination. Peace be unto you. Thank you for visiting!